Dominick leads the now-outlawed crew in search of treasure in the secret pirate haven known as The House of Four Winds. They encounter the sorceress Shamal, who claims Dominick for her own — but Clarice has fallen hard for Dominick and won’t give him up without a fight. Swashbuckling adventure, indeed, and quite heavy on the swashbuckling. Although it was a light and fun adventure story that left a smile on my face at the end. Even though there were quite a few negatives, I still enjoyed The House of the Four Winds and am looking forward to see the rest of the sisters' stories. The main positive of the story is the characters. I quite liked Clarice/ Clarence. She was a strong heroine who knew what she wanted and was willing to go to rather unorthodox means to get it. The way she cared about the crew of the ship, and later the people on the island where the House of the Four Winds was located, showed that she had morals and a heart, and that she was ready to use her sword fighting skills in defense of those morals. The secondary characters of the likable parts of the crew aboard the Aesino, including the helpful doctor, were equally as charming. I didn't really like Dominick for most of the book. Sure he's a nice guy, but he just doesn't have much personality other than trying to be a good guy. He does later get a bit more backbone, but the romance was never really believable for me. Speaking of romance, I just never shipped Dominick and Clarice. It was odd because it was part slow burn and part insta-love. SPOILERS AHEAD. For one, Clarice waited almost the entire novel to tell Dominick that she was a she and not a he (and this is just not quite believable, as one woman stuck on a ship for months would indubitably be found out). But, almost immediately after Clarice admitted she was a she, Dominick told her that he loved her. He told her that he even loved her thinking that she was a he. It was just….odd. Other than the romance between Dominick and Clarice, I really liked the friendship between them, and even between Clarice and the rest of the crew. They made a good team, and their friendship grew naturally over the course of the book which felt more real than the love story ever did. There were also some inconsistencies. SPOILERS AHEAD. When the crew first mutinied against the former captain of the ship, they are worried about arriving in Cibola because they would be arrested. However, Clarice later decides to try to escape with a small boat from the House of the Four Winds because she, as princess of Swansgaarde, would be the best person to present their tale to the governor at Cibola. Well, why wouldn't she have just done that when they would have been merely mutineers and saved themselves the trouble? 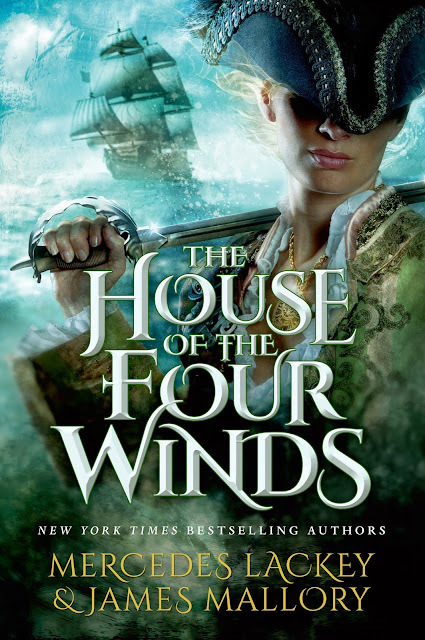 There were some pacing issues in the book, as most of The House of the Four Winds is mostly about Clarice learning about being on a ship for the first time. The first third or so of the book is about the lead up to the mutiny (which is not really a spoiler as most of the book is laid out in the synopsis). And you don't meet the sorceress until after the 50 percent mark. But after the ship arrives at Dorado aka The House of the Four Winds, things start to progress rapidly. The House of the Four Winds was a cute and light adventure story with a small bit of romance that had me smiling at the end. I had fun while reading it and got to see some high seas adventures (and a sea monster!). This definitely convinced me that I need to try one of Mercedes Lackey's solo novels - I'd like to see what she does with a full high fantasy adult novel.